Steven is an average guy trying to make sense of himself, his above-average wife and children. He enjoys all things out-of-doors so he can legitimately claim he's trying to think "out of the box." Check out Steven's first short story, Negotiated Love. Grace stared at the untanned circle on her ring finger a few moments. She had worn her gold band with the third carrot diamond for 35 years when her husband Paul died suddenly. She continued wearing it afterward, even after she met Charlie, even after they had dated and discussed marriage. Charlie wore his, too. Sometimes, when they went through the temple, strangers would assume they were married to one another. And now, sitting in the temple in the bride's waiting room, she had a phantom feeling where the ring used to sit. 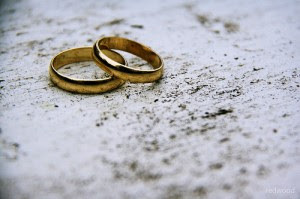 What do couples do with wedding rings from first marriages? Do they keep them? Do they put them away, give them to children or grandchildren? Where do you store 35 years worth of intimate memories with another person? Rings on hands that had held babies, dug gardens, sliced onions, given blessings. Hands that had explored every inch of skin we call a temple. Both Grace and Charlie felt awkward about using their old wedding rings for a new marriage. Finally, they had settled on an idea. A new marriage would mean a fresh start, but they both felt they brought along memories of their past marriages. So, they decided to turn something old into something new. They agreed to go to a jeweler, and using the original rings, come up with new rings. The gold would be melted, the diamond reset. The day before they met with the jeweler, Grace cried. And cried. And cried. Charlie did, too. He had been married about 37 years when his wife died. He had rarely been without his ring, wearing it always as a token of his love and commitment. When they went to the jeweler, they both felt true excitement at the designs and ideas offered by the jeweler. By the end of the meeting, both enthusiastically took off their rings and handed them over. Then, after an early dinner, Charlie dropped Grace off at her house. And both went home and cried and cried and cried. When they met with their bishops and stake presidents, they were assured that they had every right to remarry. It wasn't anyone's business but their own. It wasn't their children's business. Nor friends. Nor family members. Not even their dead spouses' business. After all, they were dead and gone and on the other side of the veil. They had each prayed about their decision. They loved one another. They wanted to be together. “Forever.” Charlie and Grace had met with the bishop separately, and he had explained sealing policies. “Why can't a living woman be sealed to more than one man at a time?” “I don't know” had been the response, along with a reminder that after Grace died, and Charlie died, that someone could seal them together. Charlie queried harder. “So, let me get this straight. If Grace had never been sealed, she could be sealed to me. I can be sealed to two living women. But because she was sealed to Paul at age 20, she can't be sealed to me now at age 60?” Again, the bishop had no explanation. He did say that it was sealing policy, and reminded Charlie that sealing policies change, so one never knew. One evening Charlie looked at Grace and said: “You know, if I could, I would have you sealed to me. I want you to be my wife forever.” They talked for hours what life might be like in the Celestial Kingdom, Grace with two husbands and Charlie with two wives. How their spouses might feel on the other side of the veil. How they were supposed to explain the other spouse at the eventual reunion in the Spirit World. To be sure, each one felt guilty about getting married again. But the more time they spent together, the less guilty they felt. With every hug, kiss and touch, the present day pushed out the mourning, the grief. And the memories. Who has time to think about the old days when the new day is filled with love? How were they supposed to act in a second marriage? The bishop read something out of the handbook, paraphrasing: “This, I think, is a quote from President Kimball. The handbook says that when a couple marry, they put each other first. To cleave means to be completely devoted and faithful to one another. Husbands and wives are to leave behind their single life and establish their marriage as the first priority in their life. They allow no other person or interest to have greater priority in their lives than keeping the covenants they've made with God and each other.” Grace interjected “When it says I'm to leave my single life behind, does that mean I'm to leave behind my 35 year marriage to Paul, and Charlie his 37 years of marriage to Joan?” This bishop shifted in his chair. “Obviously no one expects you to completely forget your experiences. They are the things that molded your character, that have brought you together. But, to be united and one flesh, you will be expected to put one another first. What that means and how you do it is up to individual adaptation.” And, despite both of them having children with their first spouses, those children should not be allowed to come between the marriage of Grace and Charlie. Ah, yes, the children. Twelve adult children between the two of them, seven of whom were married, the rest in various stages of college, mission and dating. And all in various stages of how they felt about their parent remarrying. The feelings ranged from “Go for it!” to “Go jump in a lake!” Is remarriage after the death of a spouse good or bad? A wonderful chance for a loving relationship or an eternal betrayal? Grace and Charlie had made a firm commitment to push forward, assuming time would heal the wounds. Time and eternity. Finally, Grace and Charlie were led into a sealing room. The children that could be there, were there. The ceremony was surprisingly simple, similar to a regular sealing, but only sealing them together for the period of their mortal lives. Nor did he promise them blessings of eternal association. Their marriage, no matter how bad they wanted it to be “forever,” would depend on descendants to stand in proxy and do it again at some later date. After the sealer pronounced them married, he asked if they had any rings they wanted to exchange. Until now, they had each kept the rings hidden from each other. Grace reached in a hidden pocket, pulled out Charlie's ring, then, holding it high, waved it for all the children to see. It was basket weave, strands interwoven meticulously, not the plain band worn for 37 years. Charlie took Grace's ring from his pocket and made the same gesture. The third carrot diamond shone bright in the sealing room lights, but the band was of a similar basket weave design. Charlie put the ring Grace's ring finger, and Grace finally felt married. Again. Then, Grace put Charlie's ring on his finger. Then, they held hands and lifted them high, this time for all their children to see.